A good kitchen cabinet layout has three features: proximity, flexibility and accessibility. But, achieving this calls for some detailed planning and insight into the needs of the family. Again you can make full use of the needs assessment forms to help you identify your needs in the kitchen. You will also need to categorize the stuff you use in the kitchen, such as knives, bowls, and plates. It is often recommended by designers that you store items where they are most frequently needed. This will facilitate the ideal one motion retrieval when the item is needed. If you can visualise these repetitive tasks you will be able to identify these areas very well. You will need to know the standard dimensions for cabinets in the kitchens. Some standard dimensions are shown in the picture below. It is important that you consider these various dimensions. Some tasks may call for different dimensions, such as the counter height in a particular area may have to be lowered to facilitate ease in kneading bread or rolling out pastry. Low counter height may also be necessary for individuals who are short, who suffer from arthritis, or some physical disability. It is important that you consider the needs of individuals in the family. Many people spend a lot of time in the kitchen and these dimensions could mean less fatigue for them so they do what they want easily in the kitchen. Dimensions are also important because cabinets hold shelves which hold items. Extra large plates will need extra-large shelves. An important point to note is that space is important in the kitchen. Most times drawer cabinets are better than door cabinets, even though it is more costly. Here, space is important. With door cabinets you can lose much needed space. Also, almost anything can be stored in drawers (pots, appliances, knives…). As for the upper counter cabinets, reach is very important. Margaret Wylde suggest the the ORZ or optimum reach zone about 20 inches up from the floor is within 44 and 54 inches, and for the disable 15 to 48 inches. Therefore, cabinet are typically located 18 to 20 inches above the counter. This is good to consider when you are thinking of adding upper cabinets. You would want these shelves to be reachable. Additionally, these shelves are narrower, for easy reach within the shelf. Cabinet placement and its features determines the functionality of the the kitchen. Building or remodeling a kitchen with the features of proximity, flexibility and accessibility takes a lot of thought, and might for some include some input from a professional designer. However, one does not need a lot of space to achieve these features. Every kitchen, regardless of size could be a joy to work in. 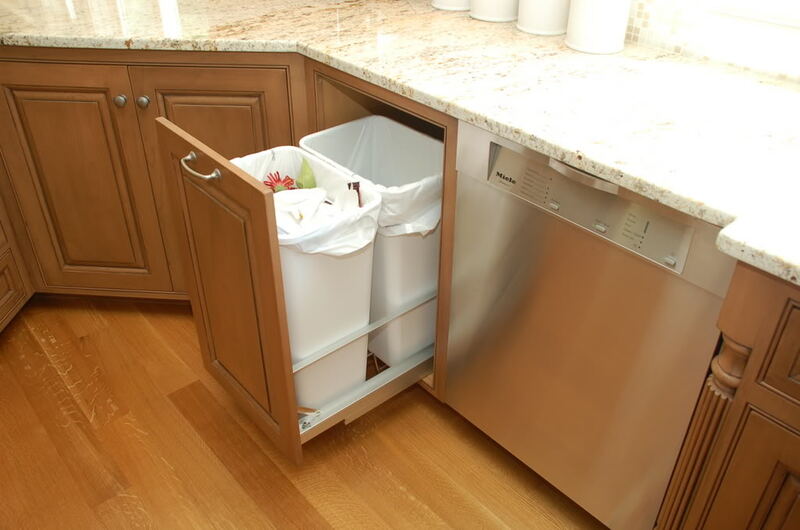 The trash, compost, or recycle bin is a major appliance in the kitchen. Locate it near the clean up center, or where vegetables are chopped, but not by the cooking center. Locating it under the sink is not convenient as you will have to regularly step back each time you have to throw away something. Keep bins size modest within the storage space. A larger bin could be placed outside.